On the way back from our fly fishing outing, my daughter and I were heading south on I-93. Just below Franconia Notch in NH, there were temporary signs along the road, alerting us to road work up ahead. Soon, traffic slowed to a crawl, which was weird for a Saturday morning when you’re going southbound. This wasn’t road work, I realized, when I saw this sign. Soon, we saw quite a few government vehicles and armed men in dark-green uniforms and wearing sunglasses. The Border Patrol. One agent, with a guard dog, was walking up to cars and seeing if the dog reacted to anything. I joked with my daughter that I should maybe talk with an accent. Soon, we were at the head of the line. I lowered the window. A very large agent looked towards the back seats and saw our bags and fishing gear. The agent waved us through. When I returned home, I did some research. 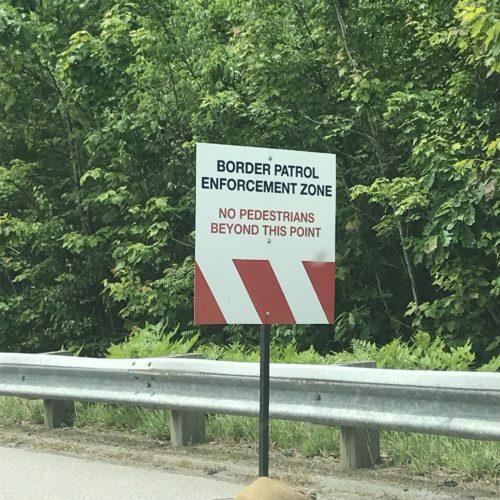 The Patrol is allowed to run checkpoints within 100 miles of the border, which means that most of the Northeast is covered. The Trump administration has increased funding for such checkpoints. I also learned that agents are looking for a number of warning signs, including when people speak with an accent. So, I’m glad I didn’t fake one. During the drive home, my daughter and I spoke a bit about the topic. Imagine if someone in the car had some drugs or THC vape oil? 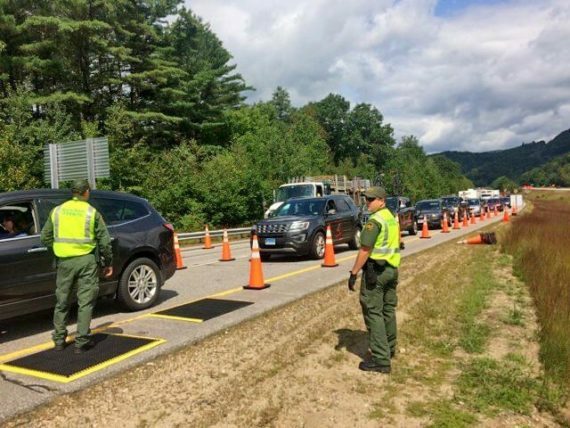 Imagine if you were an illegal immigrant and just returning home from a hike in NH? Imagine if you were legal but spoke with a foreign accent and wore traditional Muslim clothing? The Border Patrol issued this press release after they finished their checkpoints. They did arrest some people and seize some drugs. Honestly, it felt pretty strange to go through the checkpoint. So many mixed emotions about it. Powerful story! Doesn’t feel like the US of A we both grew up in. Doesn’t feel great at all. Here in the Southwest, these checkpoints have been common since I can remember – 40 years or more. Traveling from Phoenix to/from San Diego, you can expect two or more checkpoints along your route. Those without proper documents avoid traveling these routes. Understood. Here in New England, I think it is a very low-efficiency operation. They stopped cars for three days during the weekend when I traveled that highway. They later announced that they had arrested five who were here illegally. Let’s say they stopped 10,000 cars over the three days, which I think is a reasonable guess. That is an incredibly low rate of arrests, given the labor costs and inconvenience due to drivers. I’ve travelled by car within the borders here in the northeast in Maine, Mass, NH, VT and NY for 50 years and never seen one of these stops. Could you imagine being separated from your children permanently in one of those stops? It’s horrible and un-American. Even if you are illegally here. Hi Eric, yes, it was a surprise to see, and go through, the check point. I read something interesting about that 100 mile limit. Sort of like the NDAA debate, where govt is given more powers that go beyond constitutional limits (even though it doesn’t seem to bother a majority of people-likely because they haven’t been affected personally by it), border agents have excessive authority in that 100 mile zone. And more interestingly, these special “border” powers actually affect more than (I think) 50% of citizens because they live within 100 miles of a border. It reminds me that we shouldn’t be focused on better and more government, we should be focused on less government power. Perhaps we should make efforts to understand what our elected officials have already done- and see if much of that needs to be scaled back. If what I read is true, Look into what powers border patrols have within 100 miles. It’s unsettling. Chris, great points, and it is great to hear from you. I think there is always a zero sum situation between security and civil liberties. I’m not sure what the balance is, personally, but I do see us drifting towards more authoritarianism by the executive branch, something which the courts allow. I hear you, but don’t let them crimp your plans. You should go to Maine and enjoy time with your family. With permanent residence status, they should wave you through. If not, they’ll be able to access an online database pretty quickly to confirm.